MEAN LITTLE MARY -- I found another pic of a very young Mary James and decided to post it. 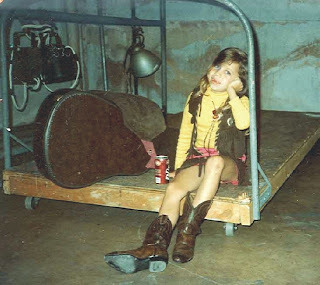 She's about six here (judging by the missing teeth) and sitting back stage at some venue or another. The lyric I posted last night very quickly developed into a complete song with a few lyric changes, a fairly sophisticated (for me) tune. I was playing it as a Bossa last night (probably because I was writing on a Classical guitar) but it probably won't stay Latin if and when I get to performing or recording. Though one never knows!